Your chimney is supposed to protect you from rain, snow and wind. However, when you have a leaking chimney, it does the exact opposite. In fact, when your chimney leaks, you’re in a lot of trouble. Chimney leaks can cause a lot of your home to be water damaged including your roof, attic, walls and brick. This can total up to tons of money in damages. There’s a way to stop this from happening. In this article, we’ll show you how to stop your chimney from leaking and prevent your home from being damaged. Let’s get started! Why Does Your Chimney Leak? There are many reasons your chimney may be leaking. For starters, the elements play a major role in the condition of your chimney. Chicago homes face rain, snow, hail, heavy winds and extreme temperature shifts which can take a toll on your chimney. Also, smoke can do significant damage to the interior of your chimney. If your chimney isn’t cleaned, that damage is compounded by the soot and creosote that lines the walls. Pinpointing the problem will help you determine the solution which will help you to prevent further damage. We’ll show you a few ways to find a leak in your chimney before it gets worse. When you have a leaking chimney, the problem often stems from your chimney crown. A chimney crown is found on the top of your chimney and is used to drain water away from your chimney. When your crown is crack or damaged, water can leak in and wear down your bricks and mortar. If it’s not tended to right away, the mortar will start to wear down. Over time, your chimney can fall apart due to significant water damage. Is There Damage to Your Roof’s Shingles? If a leaking chimney has gone undetected for a while, you’ll start to see water damage around your home. One of the first places you see this is with your roof shingles – specifically the ones near your chimney. When you notice this, you’ll need to take action immediately. Otherwise, the problem begins to compound on itself and can get significantly worse. Plus, who knows what other parts of your home have sustained water damage? The best thing you can do is hire a professional to perform a chimney inspection. They’ll check your chimney and make sure there are no leaks. If there are any problems, they’ll know the best solution for you. There are three levels of chimney inspections: level 1, level 2 and level 3. Level 1 will check all visible areas thoroughly, level 2 is more in depth and used when people change their heating system and level 3 is used for severe damage. Once you’ve pinpointed the leak, you’ll need to fix it. Depending on what happened, there are a few things you’ll need to do. Some of these tips are also preventative and can help you stop you from having a leaking chimney again. Tuckpointing is the act of fixing and replacing your brick’s mortar joints. When your chimney is leaking, the mortar is one of the first things that becomes damaged. Plus, when facing the elements, the mortar will deteriorate naturally. It can even be the main cause of your chimney leak. Chimney tuckpointing is the solution to this problem. You should hire a professional to do this because it’s not an easy task. They’ll climb on your chimney and reapply new mortar to the bricks. This will effectively seal any hole and fix any damage. Your chimney flashing is very important when it comes to keeping water out of your home. It’s the area where your chimney meets your roof. It’s used to seal off the meeting place and prevent water or air from seeping into your home. If your flashing is damaged in any way, that’s a major problem. You’ll need to reseal it to prevent any major damage from occurring. For minor cracks, you can get flashing sealant from any department store but we recommend working with a professional. There could be other unforeseen problems leaking in your chimney. You can read more about chimney flashing in one of our chimney flashing article. If you think your flashing is the source of the problem, we recommend checking it out. When you use your fireplace, smoke billows out through your chimney. That also means soot and creosote start to cake the walls of your chimney. This can be very dangerous and cause fires. It can also damage your chimney, causing leaks. The best way to prevent this from happening is to have your chimney cleaned. Also known as chimney sweeping, it’ll remove all of the soot and creosote that has built up overtime. How often should you have your chimney swept? There are a few metrics you should look at. The safe bet is to have it swept every 50 burns, but different fire sources, such as gas logs, burn cleaner. If that’s the case, you can measure the soot in your chimney. If it’s more than 8 inches thick, you’re due for a chimney cleaning. You can also have a chimney inspection performed to determine whether or not your chimney needs to be cleaned. It’s very important that you do everything in your power to prevent your chimney from leaking. This includes waterproofing your chimney. It’s exposed to extreme weather year round and needs some protection. When you waterproof your chimney, you’re preventing water from penetrating your chimney. Your brick and mortar will last longer even though the harshest conditions. As we previously mentioned, your chimney crown is found at the top of the chimney and its main purpose is to reflect water away. When it’s cracked or damaged, moisture will seep in your home easily. 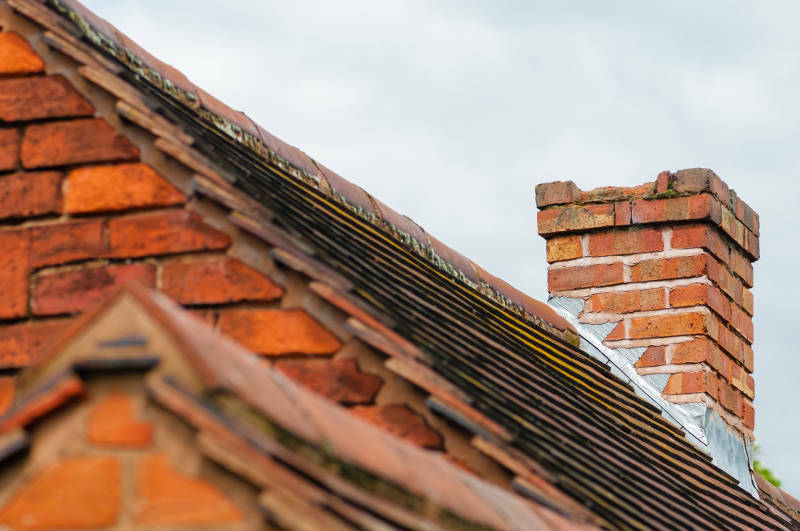 If you see any cracks, chips or damage to your chimney crown, call a professional to repair it immediately. A leaking chimney is a major problem that needs to be addressed or you’ll be spending a lot of money on repairs. Water damage to your chimney, walls, roof and mortar are all the result of neglecting your chimney. Whether it’s waterproofing, inspections or cleanings, Early Times Home Solutions is here to help you. We’ve been making Chicago homes cleaner and safer for over 30 years. In fact, chimneys are our specialty. If you’re worried your chimney is leaking or want to see if you have any undetected problems, get a free quote now.